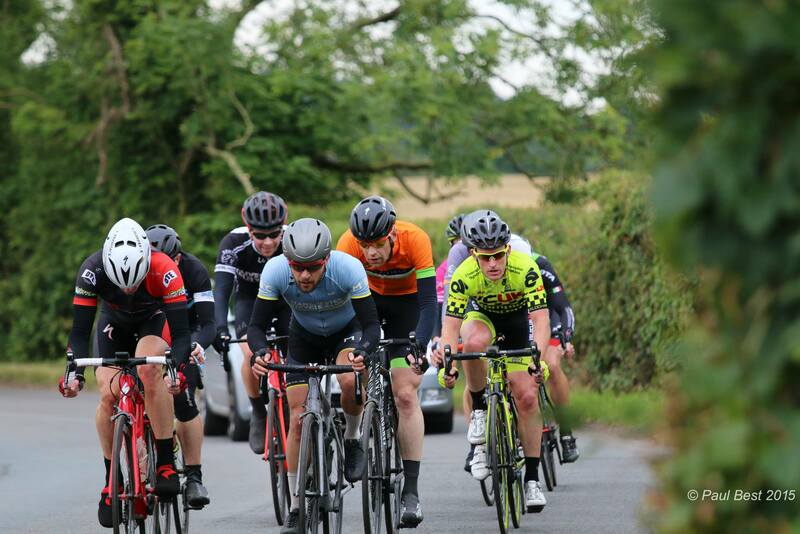 Regardless, I made my way to Ormskirk for the High On Bikes Road Race – 14 laps of a short 4 mile circuit – the only notable feature being a fast, narrow, twisty descent. The race actually finishes on an ascent of Clieves Hill not on the main course. The roads were wet, and there was a fair amount of wind, and these were good signs that it was a day to be in a break. That was my aim anyway, as I am chasing down my First Cat license for next year. The start of the race is a bit strange, as we are neutralised on our way down the hill the first time, and are stopped at a junction onto the course. After we all relieved ourselves for the last time, the lead cars pulled away and the race began – crit style – with the bunch being stretched out for the first mile. Attacks off the front were frequent but no one were allowed to escape for the first couple of laps. On the third lap, a promising attack went with a couple of strong riders and as they were pulled back I was ready at the front for the counter, which I jumped on. Timing it well, we hit the incline into the wind, and we got a 30 second gap from the bunch. There were 9 of us; Declan Husdon, Chris Quin, Andrew Disley, Matt Lythgoe, Ryan Ellis, Christian Smith, Philip Gray and Andy Martin. Soon we got into formation to extend our lead, there was some strong legs in this group! Andy got us all together and set a commanding pace. Our group worked well together, with only one or two less strong riders staying at the back, and after a few more laps we had built up our lead to a minute thirty. But I wanted to ensure this break lasted, so I kept pushing the pace till we hit two minutes. 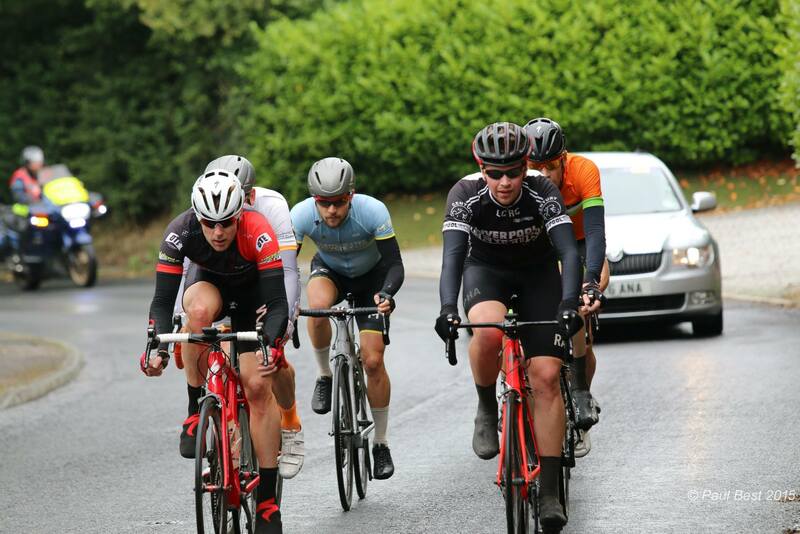 There were two primes on the course at laps 9 and 4, each taken by Chris Quin and Declan Hudson respectively, and the rest of the group were happy not to contend. The rest of the race was pretty uneventful with the group continuing to work well, everyone (mostly) doing their turn wherever they could. We were still all together on the bell for the last lap, and at this point there were strong signs of some riders tiring with fewer riders still doing turns at the front. It was only the stronger riders in the group still working, and it was time to shake off some of the weaker riders. The weather had improved by now, with warmth and sunshine poking through the fading clouds, and the roads were drying up nicely enough to allow us to attack the corners and descent. So we pressed hard on the last climb and really strung out the group into the tight left hander that led to the descent. I was the front, with Chris and Declan on my wheel. Declan attacked immediately, Chris followed, and after they got a few bike lengths, I attacked too. We immediately gained a good few bike lengths and at the top of the descent, the group were out of sight. We descended the hill like lunatics, and once round the two sweeping left turns, never saw the group again. It was now half a mile to the left turn up Clieves Hill for the finish line, and none of us were attacking. We were still going hard to maintain the gap, but all of us trying to conserve as much energy as we could. We were all tiring now, but knew a really tough sprint was coming up. All three of us made the turn together and then rode side by side for a hundred yards waiting for the jump….which came from Declan. Chris and I gave chase, but Declan is super strong and had been impressive all race. He was too much for Chris who lost a bike length, and Chris kepts a couple bike lengths from me. And that is how we finished, the win going to Declan, second place to Chris Quin, and myself coming third. I was disappointed that the win had escaped me, but still pleased with the points haul and my performance today. Both Declan and Chris were really strong and deservedly got the top two spots. In the end, we had 30 seconds on the rest of the break who rolled in one by one up the hill. I was surprised that Andy had not been with us in that last attack, but I later learned he punctured somewhere on the last lap, but still made it to the finish just in front of Matt Cartlidge – chapeau! We had build up over two and a half minutes on the bunch as well, where Karl, Billy and John safely rolled in. Paul had packed early on and was at the finish line with Craig who had ridden out to give support. The High On Bikes Clieves Hill road race is always a popular event, as it is really, REALLY well supported and the organisers execute the day to perfection. The short course makes it a good day for spectators, and all of the corners were full of people. 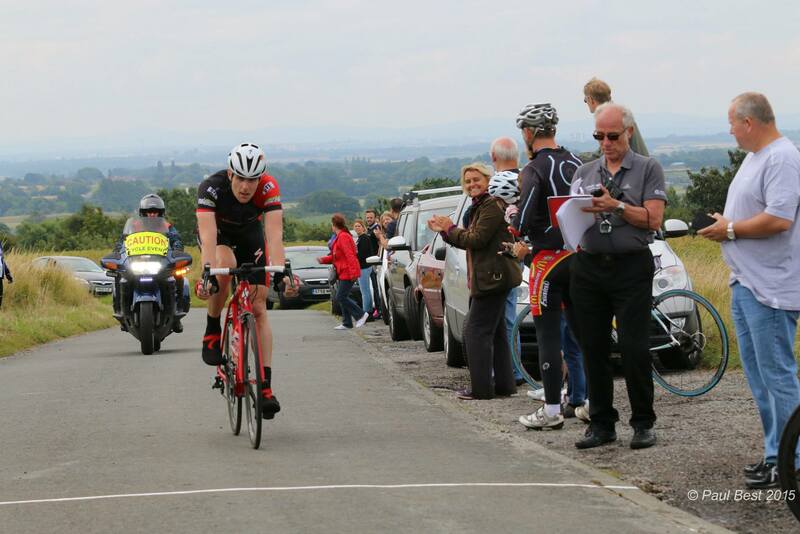 The finishing climb was no different, and made the race feel a bit more special! So I’ll finish off by saying thanks to High On Bikes for putting on another great event and the very generous goodie bags we all got, the NEG outriders and marshalls for giving up their free time to ensure we were always safe, and the helpers back at HQ for the scrumptious post race grub! Special thanks as always to Ellen Isherwood and Paul Best, two of the Northwest’s finest photographers, who captured the day to perfection with images for everyone to remember. This entry was posted in Results and Reports and tagged Clieves Hill, High On Bikes, Kris Zentek. Bookmark the permalink.